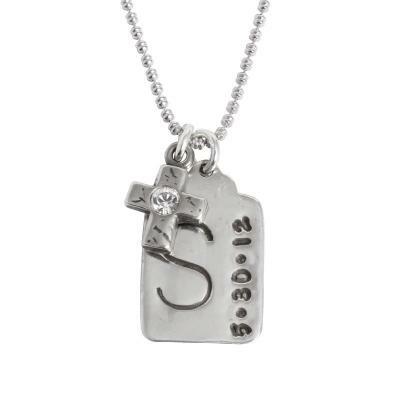 "Stamped Tag Memorial Jewelry with Cross, Silver"
The personalized memorial necklace is a unique and beautiful design which will keep those you love close to your heart. Create a piece of bereavement jewerly to help you remember the love. The personalized memorial necklace is a unique and beautiful design which will keep those you love close to your heart. This beautiful necklace comes with one cross charm with birthstone. Available in two stamping styles - vertical and horizontal - we stamp a large initial and then either the full name or date to the side or along the bottom. The sterling silver charm hangs from our sterling silver ocho chain. You can put the initial of the remembered person's first name, last name or nickname as the large initial and then either a birthdate or a date on the side. For example, you can put an A for the person's first name and then GRAMMY with a heart on the side. Or a large B and then a special date. For the vertical option, the block letter is along the left side with a maximum of 7 characters stamped up the right side. For horizontal option, the block letter will be centered on the top section and the name will be stamped along the bottom with a maximum of 5 characters. All silver is sterling. Stamp Tag is Approx. 3/4" by 1/2". Cross is approx. 3/8" high. Available with a 16" or 18" sterling chain. All sales final.